18th 20th November 2016 at the Exhibition Centre Agira (EN): stands, music, folklore, gastronomy. 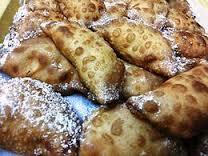 Cassatelle are Sicilian sweets typical of Enna gastronomy, originating in the town of Agira. Have a crescent shape, prepared with shortbread, tender and golden yellow color dusted with icing sugar, with a delicious and tasty filling of a cocoa mixture, chopped almonds, chickpea flour, sugar and dried lemon peel, with possible addition of cinnamon. The festival is dedicated to Cassatelle: it that takes place in the birthplace of Diodorus of Sicily, Agira, every year in the fall. It is difficult to document the history of casatella because there are no written sources about it. Oral sources that you can get on the territory of Agira, are therefore related to an empirical knowledge of the subject and often relate to a period of fairly limited time, coinciding with the personal experiences of the artisans. At least in its earliest version called pasticciotto now disappeared, had circular form and was characterized by a button at the center of the upper disk, as if to recall another Sicilian dessert, the minni ri vergine , (literally means breast of the Virgin) sweet dedicated to Sant’Agata. The Spanish culture had a great influence on the origins of cassatella, later new elements were added to the traditional cassatella made of ricotta cheese, some of these coming from the higher class and some from the poor one. So noble elements such as almonds and cocoa were mixed with chickpea flour to fulfill the role of condensing natural, widely available and cheaper than the filling. Sure that you will appreciate this special sweet, throughout the Festival of cassatella, you can take the chance to visit the near Sicilia Outlet Village and do some shopping of the best Italian brands. Catania is less than one hour far from Catania, so you can choose an accommodation in one of the Villas in Catania.